Inside a tide pool in Santa Cruz, California showing sea stars, sea anemones, and sea sponges. Rock pools (or 'tide pools') are rocky pools by the sea. They are in the intertidal zone. They are filled with seawater during high tide, and exist as separate pools at low tide. Tide pools are habitats of uniquely adaptable animals that have engaged the special attention of naturalists and marine biologists. 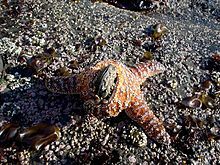 Tide pools are a home for hardy organisms such as sea stars, mussels and clams. They must be able to cope with a constantly changing environment — fluctuations in water temperature, salinity, and oxygen content. Huge waves, strong currents, exposure to midday sun and predators are only a few of the hazards that rock pool animals must endure to survive. Waves can dislodge mussels and draw them out to sea. Gulls pick up and drop sea urchins to break them open. Starfish prey on mussels and are eaten by gulls themselves. Even black bears sometimes feast on intertidal creatures at low tide. Although tide pool organisms must avoid getting washed away into the ocean, drying up in the sun, or getting eaten, they depend on the tide pool's constant changes for food. The water level is always changing. Twice a day, the tide rises up the shore and then goes back again . When the tide starts to go back out, the upper shore is left exposed until the next high tide, 12 hours later. The rocks around the rock pool are covered by seaweed . seaweeds are plants, but they do not have roots like garden plants. This zone receives spray from wave action during high tides and storms. At other times the rocks experience other extreme conditions, baking in the sun or exposed to cold winds. Few organisms can survive such harsh conditions. Lichens and barnacles live in this region. In this zone, different barnacle species live at very tightly constrained elevations. Tidal conditions precisely determine the exact height of an assemblage relative to sea level. Since the intertidal zone often desiccates when the tide is out, barnacles are well adapted to water loss. Their calcite shells are impermeable, and they possess two plates which they slide across their mouth opening when not feeding. These plates also protect against predation. The high tide zone is flooded for hours during each high tide. Organisms must survive wave action, currents, and exposure to the sun. The high tide zone is inhabited by sea anemones, starfish, chitons, crabs, green algae, and mussels. Marine algae can provide shelter for such organisms as nudibranchs and hermit crabs. The same waves and currents that make the life in the high tide zone difficult bring food to the filter feeders and other intertidal animals. This area is mostly submerged – it is exposed only during low tide. It is teeming with life. There is much more marine vegetation, especially seaweed. There is greater biodiversity, but organisms in this zone are not well adapted to dryness and temperature extremes. Low tide zone organisms include abalone, sea anemones, brown seaweed, chitons, crabs, green algae, hydroids, isopods, limpets, mussels, nudibranchs, small fish, sea cucumber, kelp, sea stars, sea urchins, shrimp, snails, sponges, sea grass, tube worms, and whelks. These creatures can grow to larger sizes because there is more available energy and better water coverage: The water is shallow enough to allow more light for photosynthetic activity, and the salinity is at almost normal levels. The area is still protected from large predators because of the wave action and relatively shallow water. Sea anemone, such as Anthopleura elegantissima, can clone to reproduce. The process is called longitudinal fission, in which the animal splits in two parts along its length. Some species, such as Anthopleura sola can fight for territory. The white tentacles (acrorhagi) are for fighting. The acrorhagi contain stinging cells. The sea anemones sting each other repeatedly until one (usually) moves. Some species of starfish have the ability to regenerate lost arms in time. Most species must retain an intact central part of the body to be able to regenerate, but a few can regrow from a single ray.The regeneration of these stars is possible because the vital organs are in the arms. Sea palms look much as palm trees do. They live in the middle to upper intertidal zones in areas with greater wave action. High wave action may increase nutrient availability and moves the blades of the thallus, allowing more sunlight to reach the organism so that it can photosynthesize. In addition, the constant wave action removes competitors. ↑ 1.0 1.1 1.2 "NPCA Tide pools". npca.org. September 5, 2008. Retrieved 2008-09-06. ↑ "Botanical beach tide pools". juandefucamarinetrail.com. September 5, 2008. Retrieved 2008-09-06. ↑ "Sea Anemones". homepages.ed.ac.uk. September 5, 2008. Retrieved 2008-09-06. ↑ "Snakelocks Anemone". British Marine Life Study Society. September 5, 2008. Retrieved 2008-09-06. ↑ "Biology:Regeneration". Dana Krempels. 2008. Retrieved 2008-09-06. ↑ Paine, R.T. (1998). "Habitat suitability and local population persistence of the Sea Palm Postelsia palmaeformis". Ecology 69 (6): 1787. doi:10.2307/1941157. This page was last changed on 12 April 2019, at 07:56.